What would you look at your board? => How I am able to make it very easy on the eye. Ease of navigation and simplicity is key for me, so some feedback on how that comes out will be great. The more opinions I get, the better. Any detail? => Just any feedback is appreciated. (Any advice on how I can get members to join to, is appreciated) I have done it before, but that was like 6 years ago. I have a competition giving away a new game, but it's no good if no one knows about it right? 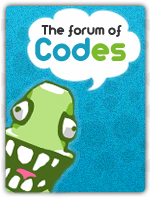 It's a very nice forum. Yeah the lack of picture beyond the banner is something I have considered. Thanks.